How to train German shepherd ? HomeHow to train German shepherd ? When you bring a German shepherd to your home the first thing come into your mind is that how to train German shepherd. Training of a German shepherd begins from day one when you brought up a new puppy to your home. Well, training of German shepherd is quite easy because German shepherd is a quick learner and he follows command quickly. A German shepherd is the best police and guard dog because of his training and advanced learning skills. In this article, we will help you to understand that how you can train your German shepherd puppy and an adult dog. 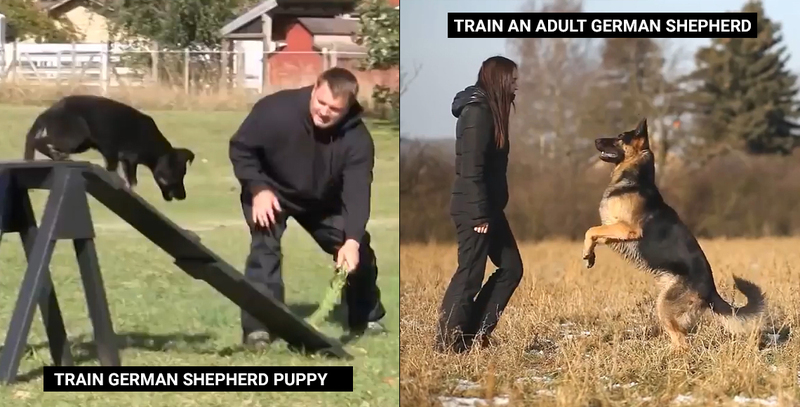 Yes, there is a difference between training purebred German shepherd puppies and adult German shepherd guard dogs. So, let’s start with the training of purebred German shepherd puppies. How to train purebred German shepherd puppies? •When your German shepherd puppy is just 8 weeks old you can start his training. When your puppy is young then it is the best time to shape and mold your German shepherd as per choice. You can develop his personality and make him strong and active which is not easily possible with adult dogs. •You have to make him prepare for his grooming at his early age, he will become a big dog and he has to understand what is good for him or what is not. So, you have to train him when he is you about his grooming through nail trimming, hair trimming, ear cleaning, paw cleaning and more. •Now, you have to train him some simple and basic commands like how to sit properly. If you want that your pup obeys your command then you have to command him softly instead of yelling on him or shouting. •When your puppy follows or obeys your command then you should appraise him with some food treats such a bone or any other thing. Your reward will motivate him and he will obey your rest commands as well. •Sometimes, when your puppy is very hungry he started showing some kind of food aggression so; you have to avoid this food bowl aggression. You should start addressing his food aggression by your hand. You should replace the food bowl with your hand and remove food bowl and feed your pup by your hands. How to train an adult German shepherd? •Begin your training with an adult German shepherd with some basic commands and steps. If you purchased an adult German shepherd then the first of all you have to establish a trustworthy relationship between you and your adult dog. •When you started your training with your German shepherd then the thing you have to do is to praise him with some food treat and toys which works as a motivator for him. Because this kind of praising will motivate him to learn and obey more commands. •Train your pure German shepherd with some specific time interval, while you are in a training session with your German shepherd you have to ensure that there is no more than 20 minutes of training is required. You have to take a break between specific time intervals when you trained German shepherd.